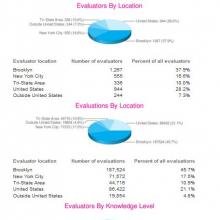 3,344 evaluators cast 410,089 evaluations. Each of the 389 images was seen approximately 1,054 times. On average, an evaluator viewed an image for 22 seconds before casting an evaluation. 3,098 comments were given during the evaluation period. 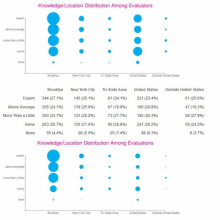 On average, each evaluator looked at 135 works. If the evaluator had submitted a photograph, the average number of works he/she evaluated was 289. 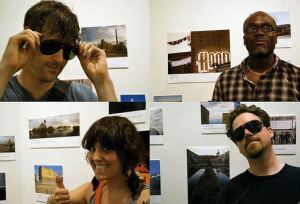 The top 20 percent of the 389 images curated by the crowd were installed in the physical gallery during the exhibition. Click! is a photography exhibition that invites Brooklyn Museum’s visitors, the online community, and the general public to participate in the exhibition process. Taking its inspiration from the critically acclaimed book The Wisdom of Crowds, in which New Yorker business and financial columnist James Surowiecki asserts that a diverse crowd is often wiser at making decisions than expert individuals, Click! explores whether Surowiecki’s premise can be applied to the visual arts—is a diverse crowd just as “wise” at evaluating art as the trained experts? Click! is an exhibition in three consecutive parts. It begins with an open call—artists are asked to electronically submit a work of photography that responds to the exhibition’s theme, “Changing Faces of Brooklyn,” along with an artist statement. After the conclusion of the open call, an online forum opens for audience evaluation of all submissions; as in other juried exhibitions, all works will be anonymous. As part of the evaluation, each visitor answers a series of questions about his/her knowledge of art and perceived expertise. Click! culminates in an exhibition at the Museum, where the artworks are installed according to their relative ranking from the juried process. Visitors will also be able to see how different groups within the crowd evaluated the same works of art. The results will be analyzed and discussed by experts in the fields of art, online communities, and crowd theory. The exhibition is organized by Shelley Bernstein, Manager of Information Systems, Brooklyn Museum. Dimensions: 7 x 7 in. Photographs copyright © 2008 the individual artists. Compilation and text copyright © 2008 Brooklyn Museum. This panel discussion on crowd-sourcing was held at FIGMENT 2008 in conjunction with Click! A Crowd-Curated Exhibition. Read more about Click! on our blog.